Hey there. I’m Diana. I’m a writer and social media manager at American Adoptions. I was adopted as an infant in 1991 through an open adoption. There was never a time when I didn’t know that I was adopted. My older brother was also adopted through an open adoption, so I remember assuming that this was the norm. 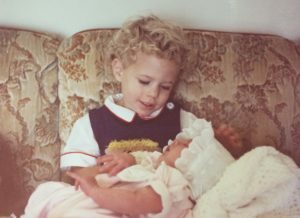 I do remember a moment when I was about 4 that I realized other children came from their mom’s tummies and that my brother and I did not. That was the first time I realized what being adopted actually meant. For most of my early childhood, being adopted meant that when either of our birth parents came to visit, we cleaned the house even beyond its normal spotlessness. I had special chores like dusting and making the lemonade, and more importantly, my brother and I got presents. We understood that these visitors were special and I did feel an odd back-of-the-brain kind of connection to them, but beyond that, it felt a bit like close family friends coming to visit. As I got older, I had common adoptee thoughts and experiences. I didn’t look much like my family, but in the sociable milling around that followed church, people would “compliment” my parents on how much their children looked like them. It bothered me that this was something that people seemed to value. I experienced momentary feelings of rejection, insecurity and abandonment, despite being absolute in the knowledge of my family and my birth family’s love for me. Sometimes the things that you know and the things that you feel are two very different things. These feelings crop up in most adolescents; adoptees are no exception. When I was a baby, my birth parents and birth grandparents visited often. As I grew up (and they grew up) they visited less and less. My family moved around frequently, and my birth parents were busy building their own lives. I remember my birth mother making a trip that took several hours with her fiancé to visit us. He gave my brother and I stacks and stacks of Pokémon cards, so naturally he received our solemn approval. It was only as an adult that I realized how important that trip must’ve been for my birth mother and her soon-to-be-husband; introducing him to the child she placed for adoption several years earlier. That was the last time I saw her until she was my sponsor at my Catholic Confirmation when I was 17. When she came for my Confirmation, her husband and their two young boys stayed at our house for the event. Meeting my half-siblings was surreal. Sleeping under the same roof as someone I was biologically related to for the first time was even weirder. Her youngest son held my hand and I think I stopped breathing. It’s one of those things that only other adoptees can understand. I haven’t seen her since then. My birth mother has since had two little girls and teaches pre-school (if you’re wondering why the visits stopped)! I always love seeing photos and updates of her kids on Facebook. I don’t remember my birth father visiting much when I was young, but he and his wife visited more often as I grew older. They were probably mildly terrified of me — I certainly wouldn’t blame them for that! As an adult, I’ve grown much closer to my birth father, in part because we live relatively near to each other and also partly because he doesn’t have any additional children of his own to tangle up his schedule! It surprises people to learn that we hang out; I’ve cat-sat for him, I helped his family with their annual Halloween haunted house this year, we regularly email and have grabbed lunch a few times. I rarely see my birth grandparents on either side as they get older, but in true grandparent form, they Like just about everything I put on Facebook. My parents still sends our birth families letters, gifts and photos every Christmas, which I know they appreciate receiving, just as we love receiving their annual letters to us. My relationship with my birth family was a bit more formal than I think most people would imagine a birth parent/adoptee relationship to be. There’s this strange animal sense of being connected. My birth father and I hold a pen the same weird way. My birth mother is passionate about the same things I am. Little things that people who aren’t adopted take for granted. To an adoptee, it’s astonishing. But of course it doesn’t feel like a parent-child relationship. My adoption has become more informal now that I’m an adult, which has opened up my relationship with my birth family to a flexible level that makes me happy. I can’t tell you how grateful I am to my birth parents. I received more than just my name and my genes from them. They gave me my family. I like them as people and I love them as birth parents and I think that’s a rare thing. My heart aches for the fear and pain they must’ve gone through when they became pregnant at a young age and the difficult decision they made for me. I’m sure that decision still weighs on them. But I’ll say what I’m pretty sure they already know: they made the right choice. I haven’t mentioned them too much up until now, because I was saving up for the gush of gratefulness you’re about to be subjected to. My family is the best. My parents are great. They never set out with any intention of being a role model for adoptive parents, but they absolutely are. If you’re thinking about adoption, look to my parents for how to do it right; with an open adoption. I’m very close with my extended family. 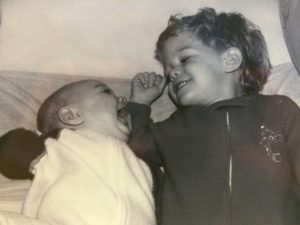 My brother and I do stand out a bit from them personality and temperament-wise, but don’t worry — that’s never mattered for a minute. They’ve always accepted us as we are. There wasn’t an inch of difference between us and our many cousins in the way we were treated and loved. In their minds, our adoptions simply meant that there were two new people to love. Several years ago, my cousins went through the same infertility heartbreak that my parents once did. My parents stepped in to offer their support. This led to my cousins adopting their now-5-year-old son from (of all places) American Adoptions, where they also chose an open adoption with my parents as godparents. The whole family met him at his Baptism. Once again, his being adopted didn’t matter for a millisecond; he could’ve dropped from the sky… it wouldn’t make him any less ours. I have an amazing family who provided me with opportunities and experiences that my young birth family couldn’t have. My parents worked so hard for the privilege to become a family, when for others it’s so easy that it happens by accident! I often wonder if that’s why their love is so fierce. Or maybe that’s just parents, right? For the majority of my life, my adoption was something that I kept pretty tightly to myself. But as I got older and my feelings about my adoption began to sort themselves out, I realized the intense need for better education about adoption. I watched couples sticking themselves with needles, taking pills and taking their temperature in an effort to have a baby. I watched young friends get pregnant and struggle between parenting or abortion. Why were all of these people so resistant every time I mentioned that I was adopted? Yes, everyone’s situation is different. Adoption isn’t right for everyone. But they just didn’t know enough about adoption to even consider it as an option, and it seemed so tragically limiting. I felt that I had a responsibility to sort of “pass on” the goodness of my own adopted life. I wanted to use my experience as a writer to be an advocate for pregnant women who weren’t ready to become parents, hopeful couples who were ready to become parents and fellow adoptees. When I saw a new writing position at American Adoptions, the adoption agency that helped bring my baby cousin into my family, and it was located only a few hours away from my family, it felt so “meant to be” that I had to laugh. I packed up and moved from Chicago to Kansas City a few weeks later. It’s strange to have adoption go from this half-forgotten backseat role in my life to the forefront of my days. But this is the best job I’ve ever had. Everyone here at American Adoptions is so caring and passionate about helping pregnant women and adoptive parents become families together. It’s as an adoptee and not as an employee that I say what a fantastic adoption agency American Adoptions is. They can help you. I promise. Since starting at American Adoptions, I’m surprised at the number of potential adoptive parents who balk at the idea of an open adoption. I understand where their fears are coming from. But I can be the grown-up voice of the baby they hope to adopt: Don’t be afraid of an open adoption. I’m a happy, well-adjusted adult (or at least as much as any of us are!) because I grew up with an open adoption. My friends who had closed adoptions or who grew up with little to no contact with their birth parents harbor understandably negative feelings about their adoptions. I can’t imagine living with such a huge hole in my heart and my history. With a closed adoption, the questions can consume you. Closed adoptions are sometimes necessary for the safety and stability of a child. But I’m here to tell you, whether you’re a pregnant woman considering adoption or a prospective adoptive parent — always choose an open adoption when you can. I’m so lucky to have such a fantastic relationship with both my birth and adoptive families. I wouldn’t be the person that I am today without both of those sides of me. Open adoption gave me that. I hope you’ll give that to your child, too. You can read Diana’s parents’ side of the story here. Such a meaningful story, Diana. You not only live an rich story, but you have the wonderful talent of being able to write it well.